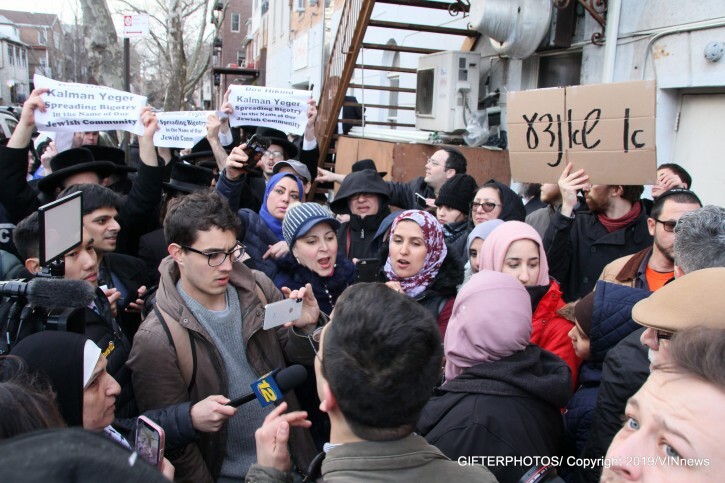 Borough Park, NY - A potentially explosive rally that had more than half a dozen groups calling on their followers to protest remarks by Councilman Kalman Yeger turned into a glorified shouting match, with the handful of demonstrators who showed up far outstripped by members of a counter-protest staged by the Jewish community. As previously reported on VIN News (http://bit.ly/2TCOj29), Yeger found himself subjected to a torrent of criticism after tweeting that Palestine does not exist and calling Minnesota Congresswoman Ilhan Omar an anti-Semite. A protest originally scheduled to be held outside Yeger’s house Thursday evening was moved to his 16th Avenue office, with former Assemblyman Dov Hikind calling for the Jewish community not to let a demonstration of hatred in the heart of the Borough Park go unchallenged. Bklyner columnist Zainab Iqbal, who called Yeger out on social media for his comments about Omar and Palestine on March 27th, sparking the city councilman’s now famous post, tweeted repeated during the rally. “i’m at the yeger protest. a woman just asked me if arabs murdered any people today and if they burned pregnant women,” tweeted Iqbal at the start of the rally. There was a heavy NYPD presence at the rally, which took began at 6 PM and lasted just over an hour. Police formed a line between the demonstrators separating them, taking the pro-Palestinian contingent out of the area in their official vans to ensure that the evening stayed peaceful. Hikind and Yeger have had their differences in the past, but the former assemblyman said that he called for the counter-protest because the planned demonstration was an attack on the entire Jewish community. Yeger did not return calls for comment on the rally. What a shame! And then we wonder why antisemitism spikes so badly? How dare Hikind come out and invoke such pure hatred?! Kalmen Yager should apologize for his racist comment! Does he not know of repercussions? Is he sane? How provocative can a uod be?!? Even a Zionist shld know to shut up yet he provokes the world against us. We Jews are in Galus. We havta lie low and not say abhorrent comments that could have terrible repercussions. How simple BP Jews celebrated with Hikind and Zionist flags is beyond comprehension too. Its nauseating to watch. Where have they fallen?? !This act of Yager should alarm every Jew and not give support to the Dov Hikinds of our times that celebrate with Zionist flags. How disgusting and despicable! what’s the purpose of Mr, Yeger turning on a fire. ? I hope the community together should condem his talk. Why is he doing this ? Do we need to bring the fire to our Boro park streets ? Very stupid and unhelpful comment by Kalman Yeger. It created a terrible backlash against Jews and against support for Israel. Totally unnecessary. It would have been far more helpful if Kalman tweeted that Palestine really DOES exist. It's now called Jordan, it consists of 78% of Trans-Jordan, and is almost 4 times the size of Israel. Let him do the work he was elected to do. Don't become another Dov Hikind! Seems like his district has no other problems. What an idiot this nobody is. Who gives him the right to provoke such a backlash? Did we vote for him to represent us on the broader political arena? Let him stick to making sure the streets are cleaned, traffic congestion is dealt with, shul and school safety, to name but a few issues. We should all speak out against this Hikind inspired idiot. “ What a shame! And then we wonder why antisemitism spikes so badly? How dare Hikind come out and invoke such pure hatred?! Kalmen Yager should apologize for his racist comment! Does he not know of repercussions? Is he sane? How provocative can a uod be?!? Even a Zionist shld know to shut up yet he provokes the world against us. You are a disgusting POS supporter of Jew hating murderers You are not a true Jew you are an evil Jew hating kapo. Now I can see what's written - that a lot of jews didn't want to leave egypt when the time came at passover eve, but a mixed multitude went with the jews, who later caused problems.After all the egyptians gave their jews matza to eat. As a councilman in the city of New York, Yeger represents all New Yorkers in his district. He represents New Yorkers who are Arab, as well as those who are Jews. Congresswoman Omar is an antisemite, but lumping that comment together with remarks targeted againts constituents he represents (Arabs) shows arrogance, lack of awareness that we are in galus, gross insensitivity to Arab constituents and is inflammatory and plain wrong. He is bigoted and increasing hate for constituants of all religions, including Jew, Arab and Christians. The truth of his comments is not the point. Some true things are better left unsaid. Kalman is a fighter for jewish causes. You people are all nuts. Of course we are all in golus but we still have a job to protect achineu benei yisroel. We need to set the narrative straight so that Linda yoimach shimo doesn't become the standard of the democratic party. We stand behind kalman. Keep up the good work! “ Kalman is a fighter for jewish causes. You people are all nuts. Of course we are all in golus but we still have a job to protect achineu benei yisroel. We need to set the narrative straight so that Linda yoimach shimo doesn't become the standard of the democratic party. You naar. You fool. You think Kalman Yeger is going to "set the record straight"? He didn't accomplish that. He accomplished the opposite. He antoginized not only our opponents (who cares, right?) but also our allies (that's something we should care about). Oh, yeah. Mr. Yeger also accomplished getting his 15 minutes of fame. Now Kalonymous Kalman should just shut up and become Anonymous Kalman again. hikind is a class act despite all the lies and negativity that kalman spread against him and his son he comes out supporting him, I recall david greenfield CONDEMNING hikind when he had the whole black face non controversy on Purim and greenfield controls yeger so when the shoe was on the other foot, yeger/greenfield him a fellow Jew when he was down. We don’t stand behind Kalman! Calling out Omar is one thing, insulting his Arab constituents and inflaming the Jew haters is entirely different. He fights for Jewish causes you say? Really?! Why doesn’t he fight the corrupt and wicked batei din the people of boro park are subjected to? If he’d really have courage he would face the problems facing your regular guy living in his district and calling out the people in power for ignoring the issues or even perpetuated the issues? But no! He won’t go there.. he’d rather stir up a hornets nest and rely on the fact that Hikind and morons like you will rally behind him. Feh. I disagree, we need to stand up as a people. Please, stop blaming this as it is the Zionist fault for hatred because the Palestinians did not want us in Palestine either. Do not pretend that this is about a land, you are no different than people always calling others Nazi and Hitler when they have no clue what it was to live in such an era. My wife's parents came from Muslim countries and they will tell you of the horror stories that they encountered, this was due to their religion and not due to Israel as it has not existed in their times. So yes we should stand as one and say Talib and Omar you are wrong. You are getting too comfortable in the US as the German Jews who did not pay attention to the writings on the wall, this in no way means they had the option to leave Germany but they still associated themselves with the Germans. With all this Neturei Karta business, I propose they go live in the west bank side by side with their Palestinian brothers, I do not see them any different than the Kusim or Karaites of Europe, if you know your history well..
we will end up again in gas chambers l. u.
I agree with you as well. The bottom line is that Yeager represents multiple constituents some of whom happen to not be Jewish. It's unbecoming of him to inflame politics that are outside his district and has nothing to do with local issues. Unfortunately, Hikind was like that and we don't need that again. “ Very stupid and unhelpful comment by Kalman Yeger. It created a terrible backlash against Jews and against support for Israel. Totally unnecessary. In the second last picture above, the woman being interviewed is wearing a Jordanian Keffiah! She would also be stoned if she were in Gaza, with a shaved exposed hair like that. We cannot and shld not fight. A Jew shall never fight. Dont bring up gas chambers now as it wont help ur argument at all. We Jews need to live our lives peacefully and not bring about antagonistic rhetoric. Thats what Yeger did and he needs to apologize NOW.